In a bit of a departure structurally, this episode actually stays focused on mending the relationship between Nanako and Mariko that was pretty well ruined when last we visited Seiran. I thought for sure we’d veer off into Saint Juste-sama and Miya-sama drama at the halfway point, but no—turns out we were saving all of that for the next episode. “Mariko…” is a bit underwhelming as episodes go, and feels driven by narrative expediency to keep Mariko integrated in the story (poor Tomoko and her normal-ness). On the upside, given Nanako’s good nature the forgiveness feels more consistent within the narrative than it may have otherwise. Mariko’s behavior, both in “I Want You” and then again here, are things completely foreign to Nanako’s sensibilities, and they rattle her to her fragile, fragile core. 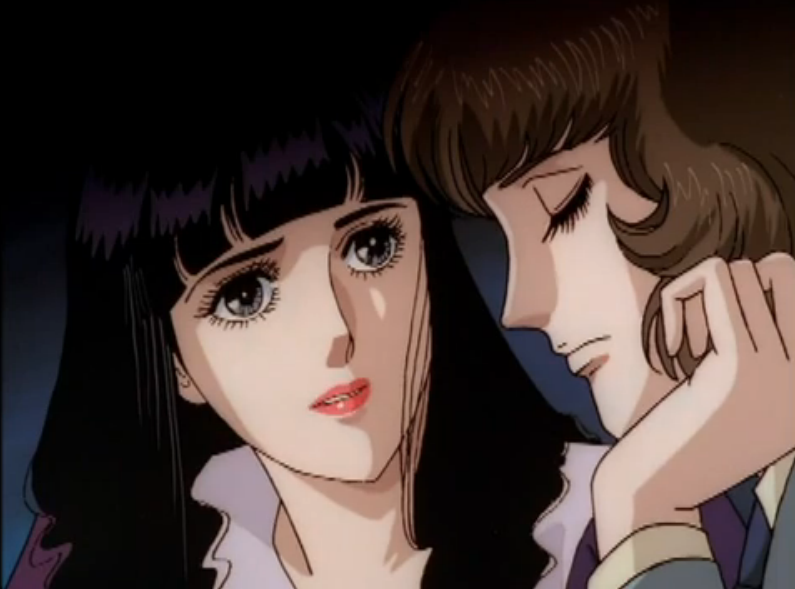 One of the challenges in watching Oniisama for someone not familiar the shoujo stories (let alone the yuri genre) is that Nananko’s purity of spirit (and relative passiveness) can be really frustrating, and maybe even a little boring. But her character type isn’t all that uncommon, or even unwelcome. Nanako’s awkwardness and goodness are necessary to propel the narrative forward, and to provide a foothold for the audience. We need someone to relate to in this crazy, messed up world, someone who helps set people on a better path (in this case, hoping that Mariko may become a bit more stable, though she and her mother still have a long way to go). It may seem a bit Mary Sue-ish, but at least Oniisama is willing to inflict some pain on Nanako, and force her to grow as much as her presence catalyzes growth in others. It’s why her decision to forgive Mariko feels like growth, an understanding of the world outside her own pain and confusion, and a recognition of that pain and confusion in others. Speaking of pain and confusion in others, Miya-sama has decided to be cruel to Saint Juste-sama once again. It’s always hard to tell how much influence in the positive way that Kaoru manages to have on Saint Juste-sama since the latter so quickly falls under the sway of Miya-sama’s very presence, whether it’s receiving an edition of Proust’s unfinished Jean Santeuil (Saint Juste-sama would like Proust) or deciding not to join in on a volleyball game. Miya-sama’s influence is seemingly absolute, something that no one, not Kaoru and not Nanako, can completely override. 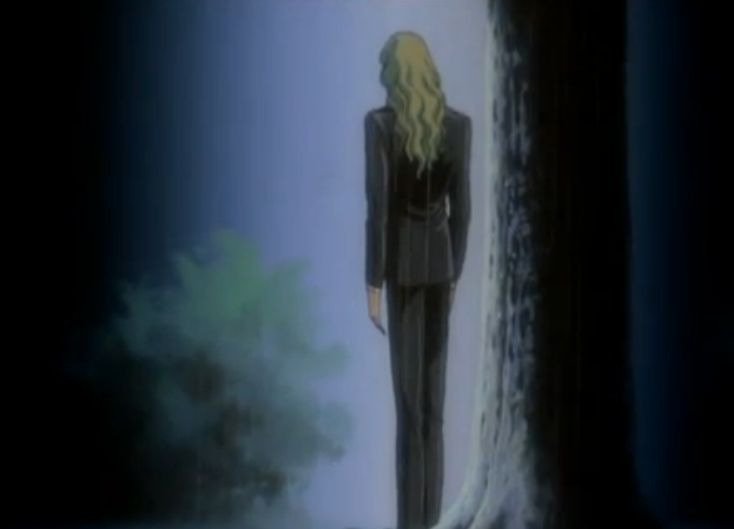 So the stranding of Saint Juste-sama under an elm tree in a torrential rainstorm is just cruelty upon cruelty (Miya-sama’s slight chuckle at seeing the rain intensify only makes it all the worse). And it, along with her overwhelming desire to return to the elm tree after Nanako manages to get her into a cab and into the city proper, just demonstrates that unstoppable influence. The mania that Saint Juste-sama demonstrates, from buying a sweet pea bouquet for Nanako to almost jumping onto train tracks, helps sell the damage that Miya-sama seems to have wrought upon Saint Juste-sama. But then there’s that apartment. We saw a brief glimpse of Saint Juste-sama’s apartment earlier, but here we see it in full, all of its mirrors, everywhere mirrors. Unlike some series where the opening credit sequence doesn’t make any sense until the very end, we’re starting to get an inkling of what’s at play in the opening now. Saint Juste-sama has already referred to Nanako as “Ma cherie la poupée,” and now we have Nanako intercut with glimpse as a tiny doll, likely the tiny doll that Saint Juste-sama is referring to. It gives the opening a little more heft, a little less randomness (I thought much of it was intended as an homage to Ikeda’s The Rose of Versailles) and a little more clear symbolism about Nanako’s toy-like nature in the eyes of Saint Juste-sama, and very likely Miya-sama’s (just guessing here, given the mention of how she dotes on Nanako). Apologies for the briefness of thoughts. Wrote this while recovering from some bad fish. Pretty much wiped out my weekend. The girls in this school, sheesh. They intrude on a perfectly nice moment between Mariko and Kaoru and then all jealous that Mariko is getting hugs from the prince. At least Kaoru is able to settle them before anything gets really out of hand. I like that Tomoko is a little hesitant to start having lunch with Mariko at the start of “Under the Elm Tree.” If Nanako is just too good, Tomoko is, despite her generally happy nature, a little more weary of people, and understandably so after the lies Mariko whispered in her ear. A quick programming note: Oniisama e… will now appear weekly (but still on Tuesdays) since Andy and I have finished Super Friends. So if you’ve been watching along—and I’m sure you have, riiiiiiiiiiight?—we’ll be picking up the pace a bit. Which is good since we still have 28 episodes to go. Just think: If I had decided to do InuYahsa we’d still have 156 episodes left to cover.